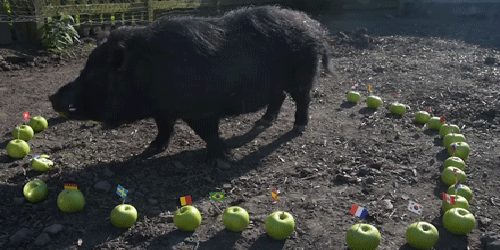 The pig with “special powers” Named Mystic Marcus, a micro pig from Heage, Derbyshire, did the prediction by eating apples marked with the flags of all the national team present in the 2018 FIFA World cup in Russia. For one football match he didn’t eat any of the apples,” “and it turned out to be a draw. It’s really bizarre.” said owner Juliette Stevens. So far his World Cup predictions appear to be on the nose – or snout – as Uruguay brought home the bacon with a dramatic victory over Egypt, while Nigeria Team Loses they first match on the ongoing FIFA WORLD CUP. 0 responses on "Meet Mystic Marcus, The Pig That Predicted Nigeria Will Get To The Semi-Final"